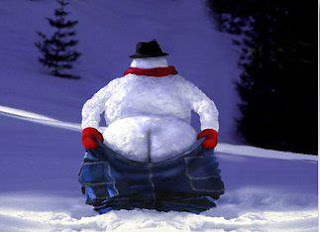 Frosty showing you his best assets....tee hee! Thanks for the laugh. I have to show my girls this, they'll want to make one. I would like to see that, haha! Makes me wonder where they got those pants! That is hysterical! Love it! Why did Frosty the Snowman pull down his pants? He heard the snow blower coming. Looks like it's time for Frosty to shed a few or those jeans won't buckle. I know how he feels! I wonder if Frosty has considered being a plumber for a winter career? He has the crack....hahahaha! Hahaha! Yeah, like Vivienne, my son is going to love that pic! Unfortunately, it reminds me a lot of the plumber who was working on the pipes under my sink yesterday... eww!